Goals from Josh Windass and Matt Crooks saw Accrington beat Yeovil to earn their fourth home league win in a row. Windass gave Stanley an early lead as he latched on to Billy Kee's through ball to score his sixth of the season. The Glovers equalised against the run of play before half-time as Josh Sheehan struck from 20 yards out. Ryan Bird went close either side of the interval for the visitors but Crooks restored the lead when he fired in the winner from Kee's knockdown. Match ends, Accrington Stanley 2, Yeovil Town 1. Second Half ends, Accrington Stanley 2, Yeovil Town 1. Corner, Yeovil Town. Conceded by Jason Mooney. Corner, Yeovil Town. Conceded by Joe Wright. Corner, Accrington Stanley. Conceded by Nathan Smith. Attempt missed. Matt Crooks (Accrington Stanley) header from the centre of the box misses to the left. Substitution, Yeovil Town. Shaun Jeffers replaces Jake Howells. Attempt blocked. Billy Kee (Accrington Stanley) right footed shot from the centre of the box is blocked. Corner, Yeovil Town. Conceded by Adam Buxton. Foul by Jake Howells (Yeovil Town). Attempt saved. 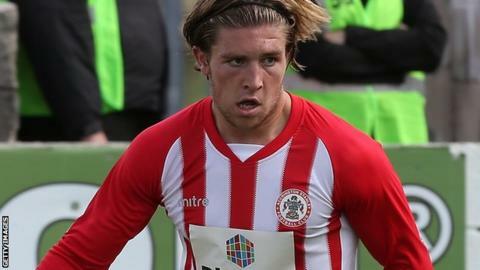 Josh Windass (Accrington Stanley) right footed shot from the right side of the box is saved in the top left corner. Attempt saved. Sean McConville (Accrington Stanley) right footed shot from the centre of the box is saved in the centre of the goal. Attempt blocked. Josh Sheehan (Yeovil Town) right footed shot from outside the box is blocked. Goal! Accrington Stanley 2, Yeovil Town 1. Matt Crooks (Accrington Stanley) right footed shot from outside the box to the bottom right corner. Assisted by Billy Kee.